Coaching begins with listening for greatness. Here are two simple Language of Listening® coaching skills which can turn any challenging moment with a child or teen into a rewarding one. Your child's greatness can be found in their intentions. 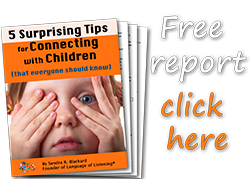 When a child makes a mistake or accidentally damages or breaks something, recognizing the child's true intention and pointing it out tells them that you understand the real them. For example, imagine your son accidentally knocks something off of a counter and it breaks. Rather than reminding him to be more careful next time (teaching) or downplaying the problem so he doesn't feel bad (fixing), a simple acknowledgment of his intention like, "You didn't mean for that to happen," would help him feel understood because it's actually true...he didn't! Intentions connect children with their inner greatness and help them see themselves in a more positive light. As you can imagine that can make a huge difference especially for those who tend to be self-critical or sensitive to criticism. Plus, by modeling this for your child now, you will be showing them how to do the same for themselves, other people, and maybe someday, even their own children. Intentions also connect children with you. Understanding your child's true intention creates the conditions of a solid relationship. Consider your relationship with a friend who you know is on your side. If they do or say something you don't like or that seems completely out of character--like offering you food that they know you can't eat or even criticizing you--your initial reaction is to feel puzzled and ask for clarification. That's you assuming their intentions are good because of the solid relationship that is your foundation. Pointing out children's intentions builds that same kind of foundation starting from the other end. Another place you can find a child's greatness is in their complaints. The most important thing to remember about complaints is that when any person is complaining, they aren't happy with something, but more importantly, they aren't happy with themselves as a complainer. Trying to fix the problem for them, judge the situation or their reaction, or teach a lesson shuts them down or makes them more defensive because it makes them feel worse about themselves. After all, if you know the answer and they don't, what does that say about them? That's why if you've tried to provide guidance or solutions for your child's complaints, they might've taken it as criticism. Of course the criticism was actually their own self-criticism being activated internally, but they wouldn't be able to see it that way at the time. Understanding that your child is reacting to their own thoughts, not to you, can help you remain present and non-reactive, and allow you to take a different approach: validate the want or wish behind the complaint. This is where you SAY WHAT YOU SEE (SWYS). It will take you and the child straight to the source of the complaint and reveal the greatness. It works for everyone because knowing our complaints are valid makes us feel better about ourselves, which moves us into a position to do our own problem-solving or ask for help more quickly. Child: "I don't want to go. I don't know anybody there. I'll be bored." SWYS: "You wish there were people there you knew. Then it would be fun." Notice how this level of understanding moves the child from feeling resistant, defensive, or selfish, toward their greatness - enjoying the company of others? When you make the case for the child, the child doesn't have to make it themselves. Defensiveness and resistance fall away. Boundary/CAN DO: "...and you have to go. Hmm. Must be some way you can make it fun, or at least get through it." Even when you know a boundary is coming, the purpose of validating what the child actually wants/wishes at the outset is not to manipulate; it is to help you truly step into the the child's point of view and open communication so you can better understand their perception of the situation. Understanding helps you get on their side and support them in the problem-solving THEY need to do to overcome the challenge THEY are facing. Teen: "My friends all hate me!" SWYS: "You want them to be supportive." SWYS: "...so what you wish they would have done was ______________." Boundary/CAN DO: "Must be something you can do..."
Teen: "I never get to do what I want! You treat me like a child!" SWYS: "You want more freedom. You're getting older, so of course you do!" Boundary/CAN DO: "This activity is not OK with me without supervision. Hmm. There must be something you can do that would be." The skill of listening for greatness is a Language of Listening coaching skill that can help you build or rebuild relationships with your child and others, but that is not all. It gives you a new understanding of human nature that can help you become kinder and more loving to yourself, too. Self-coaching Tip: In your self-talk, try responding to your own accidents and complaints by listening for greatness, and experience the difference for yourself.